There are it seems no wireless-enabled light switches available in the standard form factor of a UK light switch. At least, that was the experience of [loldavid6], when he decided he needed one. Also, none of the switches he could find were open-source, or easy to integrate with. So he set out to design his own, and the Theia IoT light switch is the result. In adapting a standard light switch, he was anxious that his device would not depend on the position of the switch for its operation. Therefore he had to ensure that the switch became merely an input to whichever board he designed, rather than controlling the mains power. He settled upon the ESP8266 wireless-enabled microcontroller as the brains of the unit, with a relay doing the mains switching. He first considered using an LNK304 off-line switching PSU chip to derive his low voltages, but later moved to an off-the-shelf switch-mode board. So far two prototype designs have been completed, one for each power supply option. Boards have been ordered, and he’s now in the interminable waiting period for international postage. All the KiCad and other files are available for download o the project’s hackaday.io page, so you can have a look for yourselves if you are so inclined. You might ask why another IoT light switch might be needed. But even though they are now available and inexpensive, there is still a gap for a board that is open, and more importantly does not rely on someone else’s cloud backend. Plus, of course, this board can be used for more than lighting. Light bulb image: Осадчая Екатерина (Own work) [CC BY-SA 4.0], via Wikimedia Commons. 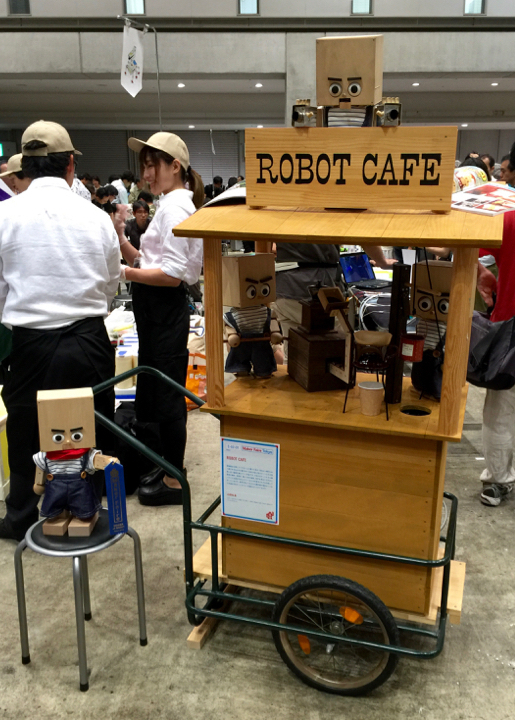 Check out the great workmanship that went into [TonyRobot]’s coffee vending version of ROBOT CAFE at Tokyo Maker Faire 2016. We’d really like to see this in action, so if anyone has more success than we did at tracking down more info (especially if it’s video) let us know in the comments below. We spot laser-cut wood making up the clever scoop design (and the numerous gears within it) but simply must know more. Technically this is less “robot” and more “automata“. The cart charmingly fuses vending machine practicality with a visual display… and a great one at that. The aesthetic of the Robot Cafe leaps over the uncanny valley and fully embraces lovable robot faces. Coffee is ground by a manual-style grinder into a scoop, which is then dumped into a pour-over filter. The hot water is then raised from below to pour over the grounds. These characters can be reconfigured based on the needs of the venue. The creator page linked above has three pictures of the same cart and same robo-baristas, but they are fishing for sodas instead. The glass bottles are lifted through the hole you can see on the right of the cart’s counter, using a fishing line with a magnet to grip the metal bottle cap. We were delighted when robot vending machines started to appear — the kind with a big glass window and a gantry that grabs your corn-syrupy beverage. But take inspiration from this. True vending nirvana is as much theater as it is utility. Looking to use up some more of his flexible LED strip, Hackaday alum and Tindie writer [Jeremy Cook] tried for a funky accent to his dinner or coffee table: light up coasters. Using his CNC router to carve out two pieces of translucent plastic to house four 3V CR2032 batteries, four pieces of LED strip, and some wire, [Cook] had created a pressure plate circuit that activated once a drink is set on it. The original layout of the circuit, however, didn’t work, and the space for the LED strips proved to be too small. A quick redesign and some more time with his router resulted in an almost working product. Initially intending to use screws to secure the coaster, hot glue provided the perfect amount of spring once he had thinned out the coaster top to allow it to more easily flex and complete the circuit. So you’ve built out your complete home automation setup, with little network-connected “things” scattered all around your home. You’ve got net-connected TVs, weather stations, security cameras, and whatever else. More devices means more chances for failure. How do you know that they’re all online and doing what they should? The Arduino has proved to be a great platform for electronics projects. The same goes for the Raspberry Pi. However, there are some projects that fall in the gap between these two options. Projects that need more memory or processing power than the ATmega microcontrollers have to offer, but not so much as to require a full Linux/ARM powerhouse. For those projects, there is the Teensy series. [Paul Stoffregen] created these lilliputian boards, and he’s been adding features ever since. The thousands of Teensy projects out there stand as proof that these little boards have been well received by the hacker community. This week’s Hacklet is about some of the best Teensy projects on Hackaday.io! We start with [Jonathan Payne] and Beats by Teensy. Beats is an all in one music machine. A sampler, sequencer, and MIDI control surface; all powered by the Teensy 3.1 and the Teensy Audio Board. The audio board gives Beats the ability to record and playback 16 bit audio at a sampling rate of up to 44.1 kHz. [Jonathan’s] inspiration came from devices such as the Akai MPC, and the MIDI Fighter. He utilized the incredible Teensy audio library on the software side. A project like this needs a serious case. [Jonathan] designed and built the perfect panel and case utilizing arcade buttons and a 128×64 LCD from Adafruit. Next we have [RF William Hollender] and Teensy Super Audio Board. Not satisfied with CD quality 44.1 kHz audio, [William] decided to add a high quality audio codec to Teensy’s bag of tricks. He picked the CS4272 codec from Cirrus Logic. Capable of sampling rates up to 192 kHz, with a THD+N of -100 db, this codec should please all but the most discerning audiophiles. The high noise immune design doesn’t stop there though. [William’s] design isolated the Teensy and the rest of the interfaces from the codec to prevent ground loops. Connectivity is via standard I2S for the audio stream and I2C for control. This means the super audio board can be used with Raspberry Pi’s and the like. Next up is [Spino] with Spino. Teensy boards can do a lot more than just audio. Spino is a POV display with 32 spinning RGB LEDs. Spino can do more than just show pretty pictures though. With a Teensy 3.2 and bluetooth radio on board, the spino team is able to play games on their display. LEDs don’t work exactly like CRTs and LCDs though, so some color changes were necessary. The team utilized cell shading with a sobel filter to make Doom look even better than ever. The Teensy is even powerful enough to handle live webcam video sent over USB. The video is rendered and displayed on the spinning LEDs. Finally we have [Tim Trzepacz] with Megsy? A homebrew Teensy 3++. [Tim] is working on Megsy as part of his residency at the Supplyframe Design Lab. Teensy’s have lots of edge mounted IO pins. There isn’t enough real estate for all the pins though, so some are routed to pads on the bottom. Megsy is a Teensy carrier board that breaks these pads out to pins. The idea is to solder the Teensy directly do the Megsy. As [Tim] calls it, “a poor man’s BGA”. The problem is getting the solder hot enough to melt while sandwiched between two insulating PCBs. [Tim’s] first attempt netted him a rather scorched Megsy board. Blacked as it may have been, the board did work! If you want to see more Teensy projects, check out our new Teensy projects list. Notice a project I might have missed? Don’t be shy, just drop me a message on Hackaday.io. That’s it for this week’s Hacklet, As always, see you next week. Same hack time, same hack channel, bringing you the best of Hackaday.io! Humans aren’t supposed to be cooped up indoors all day, but who wants to be bothered by UV rays, insects, allergens, traffic, physical activity, and other people? On the other hand, a gloomy living space generally inhibits productivity — if not making it difficult to find what you’re looking for. So, if you’re looking to illuminate any room in your place, and you have the cash and the patience to wait for its widespread release, CoeLux is a skylight that needs no sky or sun — not that you’ll be able to tell the difference. The Italian developers [CoeLux Srl] are perhaps wisely remaining tight-lipped on how the effect is achieved, but confirm that nanoparticles in the skylight mimic the effect of atmospheric fluctuations, compressing that vast deep blue into a few milimetres while maintaining the perception of infinite depth. Earlier in the month, [Elliot Williams] quipped that it had been far too long since we saw a VFD-based amplifier build. Well, that dry spell is over. This week, [kodera2t] started showing off his design for a VFD headphone amp. Here’s the thing, this isn’t using old surplus vacuum fluorescent displays. This is actually a new part. We first covered it about 18 months ago when Korg and Noritake announced the NuTube. It’s the VFD form factor you would find in old stereo and lab equipment, but housed in the familiar glass case is a triode specifically designed for that purpose. Check out [kodera2t’s] video below where he walks through the schematic for his amplifier. Since making that video he has populated the boards and taken it for a spin — no video of that yet but we’re going to keep a watchful eye for a follow-up. Since these parts can be reliably sourced he’s even planning to sell it in his Tindie store. If you want to play around with this new tube that’s a pretty easy way to get the tube and support hardware all in one shot. This is not a hack, it’s being used for exactly what Korg and Noritake designed it to do, but we hope to see a few of these kits hacked for specific tastes in amp design. If you do that (or any other VFD hacking) we want to hear about it! And now for the litany of non-traditional VFD amps we’ve grown to love. There is the Nixie amp where [Elliot] made the quip I mentioned above, here’s an old radio VFD amp project, in this one a VCR was the donor, and this from wayback that gives a great background on how this all works.